Mustapha Babadidi of Gombe United FC, based in the city of Gombe in northeastern Nigeria, is arguably the hottest player in the Nigeria Premier League 2012. The young striker is the current top scorer in the league with six league goals in eight matches, the same number of goals as striking partner Sanusi Sani. 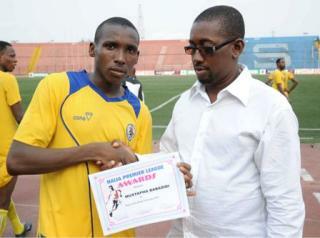 Babadidi was recently picked as the Naija Premier League Player of January. Babadidi joined Gombe United FC before the Nigeria Premier League 2010-2011, apparently from an amateur club called Flash Flamingoes FC. Babadidi made a great impression, although he was often used as a substitute. Babadidi scored four league goals during the season, five goals behind top scorer Adamu Mohammed. Mohammed joined Dolphins FC after the season, making room for the partnership of Babadidi and Sani, so far the success story of the new season. It’s not easy to find information about Babadidi. Gombe United FC is a club that rarely gets any attention, as often is the case with the clubs from the northern parts of Nigeria. Babadidi is primarily a centre-forward or a right-winger. He is known for his ability to peel off defenders and to run into space. He is an extremely fast player with good ball control and dribbling abilities. Based on pictures I’ve seen, he seems to be rather average in size, obviously not a target man but more of a lively, lightening-fast attacker. After the match, Austin Eguavoen, the coach of Enyimba FC, stated the following: “Babadidi is on top of his game, he will not stop running”. The birthdate of Babadidi is not known but I am pretty sure that he is very young. According to 2muchsports, Babadidi is born 16.10.1997, which I believe must be a spelling error. If this was correct, Babadidi would have been 14 when he scored his first league goal in Nigeria, which seems unlikely. MTN Football has previously described Babadidi as a “youngster” while SuperSport has referred to Babadidi as a “teenager”. Earlier this month, kpaka2score.com described Babadidi as a “16-year-old striker”, suggesting that he is born in 1995. Personally, I think this could be correct. The full name of Babadidi is “Mustapha Sule Babadidi”. He is sometimes referred to as “Babadidi Sule”. Babadidi is still a relatively unknown name in Nigerian football but his recent performances have been tremendous. If his talent is developed in the right way, Babadidi could become the next star player leaving the Nigeria Premier League, following in the footsteps of for instance Ahmed Musa of CSKA Moscow. The picture of Babadidi is taken from naijaligue.blogspot.com.